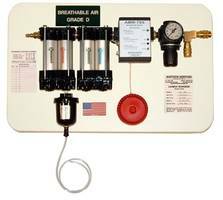 Compliance with the OSHA requirement for Grade "D" Breathable Air can be accomplished with the use of a Quality Air Breathing System manufactured by Martech Services Company. According to Tom Wright, Director of Sales and Marketing, when placed near the point of use, a Quality Air Breathing System will work with the existing compressed air supply. The four stage filtration, filters the air, and the on board carbon monoxide monitor continuously monitors the air quality for compliance with current OSHA standards. With the ever increasing awareness and need to properly protect workers while working in contaminated air spaces, the systems are designed for multiple users and ease of use. Systems are capable of supporting two or more persons at the same time. Accessories can even increase or decrease the temperature of the air supply for improved user comfort. More information on Quality Air Breathing Systems can be obtained by calling Martech Services Company at 800/831-1525.